After working in this type of construction for over ten years, I formed Gagner Waterproofing on February 1, 1978. 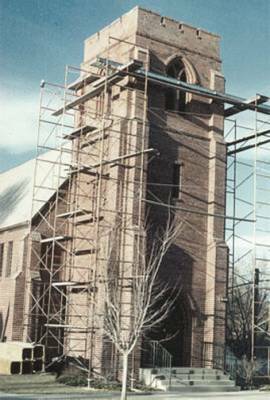 On July 1, 1981, the company was incorporated and the name changed to Gagner Restoration, Inc. to encompass the different phases in caulking, masonry restoration, waterproofing, water blasting, and tuckpointing. The types of waterproofing are clear coatings, membrane waterproofing, and below-grade waterproofing. We do urethane caulking of new construction or recaulking of expansion joints, control joints, walls, door frames, etc. We also do sealing of joints in parking lots. In the masonry restoration and tuckpointing line of work, we repair brick or block in existing walls and cut out and repoint deteriorated mortar joints. The operating officers of the corporation are Myron L. Gagner, President and Karen L. Gagner, Secretary-Treasurer.